No, it’s not the discovery of an unknown Richard Lester film*, but the impending prototype manufacturing collaboration for a battery that promises 450 Watt-hours per liter. Four heavy-hitters in German industry plan on making (fabricating) the flat-panel EMBATT battery into a reality – with all speed. 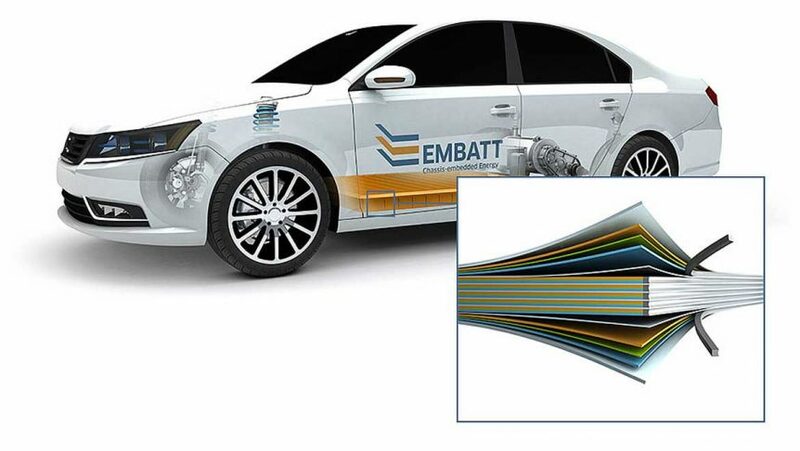 thyssenkrupp System Engineering GmbH, IAV GmbH, Daimler AG, and Fraunhofer IKTS (Institute for Ceramic Technologies and Systems) have teamed up for the “EMBATT-goes-FAB” project sponsored by the Federal Ministry for Economic Affairs and Energy. 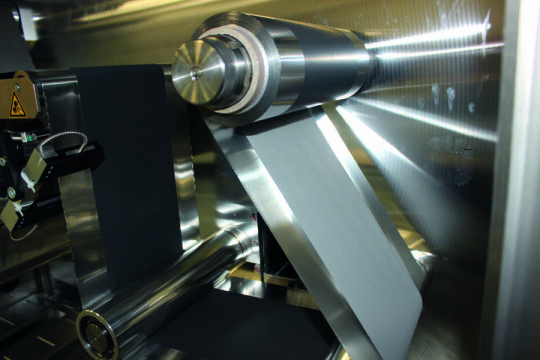 thyssenkrupp specializes in planning, designing and implementing production lines for cylindrical, pouch, and prismatic batteries, and will apply that expertise to the new format. IAV provides engineering and consulting services to auto makers worldwide, and has a depth of knowledge in battery development. Daimler, of course, would have testbeds ready in car or truck size, and would have a vested interest in seeing batteries that can promise 1,000 kilometer (620 mile) range for their vehicles. 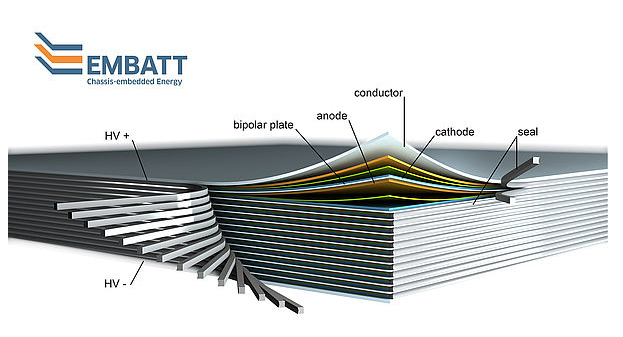 EMBATTs are bipolar Li-ion batteries, which like fuel cells, consist of stacked electrodes connected in series. In contrast to conventional Li-ion batteries, these electrodes are, as the name indicates, bipolar. This means that the active materials for the battery cathode and, overleaf, the active materials for the anode are applied to a common electrode carrier. The individual Li-ion cells are then no longer packed separately in aluminum housings. Only the finished stack of electrodes is given a fixed housing. This eliminates housing components and connecting elements, which saves costs and space in the vehicle. Fewer internal connection – thousands in a Bolt or Tesla battery pack, for instance – mean fewer points of potential and lower losses due to resistance. The FAB four will share development and production duties. Fraunhofer will produce improved bipolar electrodes based on lithium-nickel-manganese-cobalt oxides and graphite as storage materials. thyssenkrupp will scale assembly technology up to a size of 1000 x 30 cm² (393.7 inches by 11.8 inches). IAV will incorporate an electric battery monitoring system, and Daimler will create safety simulations to address specific vehicle requirements. The EMBATT project seems destined to meet its 2020 deadline for larger-scale production. *Lester directed the original Fab Four in the films A Hard Day’s Night and Help.